NEW ORLEANS — Who knew a childhood-favorite game could be played with the most recent women’s version of The Bowerman Award Watch List? Duck. Duck. Duck. Duck. Duck. Goose. A child would get quite the workout before getting another to chase him or her around the circle. Also Receiving Votes: Deanna Hill (Southern California), Sha’Keela Saunders (Kentucky), Karissa Schweiszer (Missouri), Lexi Weeks (Arkansas), Tori Weeks (Arkansas). Oregon earned the respect of The Bowerman Award Watch List Committee in a big way and has five athletes on the Watch List that was released Wednesday by the U.S. Track & Field and Cross Country Coaches Association (USTFCCCA). This is the first time in the history of The Bowerman Award that one program had more than three athletes on the Watch List at one time (The Ducks also accomplished that feat this season). When the first Watch List debuted in early January, Oregon placed three athletes on the list: Raevyn Rogers, Deajah Stevens and Ariana Washington. Since then, Hannah Cunliffe and Sasha Wallace joined their teammates. Rogers, Stevens and Washington cemented their spot on the Watch List over the first month of the collegiate track & field season. Rogers recently ran her first two 800s of the regular season at the East-West Challenge hosted by Columbia. She went sub-2:02 in the open for the second time in her career indoors (2:01.75) and added a strong half-mile in the middle of UO’s collegiate-record-breaking distance medley relay. The Ducks’ quartet of Lilli Burdon, Ashante Horsley, Rogers and Katie Rainsberger got the baton around in 10:48.77, which broke the previous record of 10:50.98 set by Tennessee in 2009. At that same meet, Stevens competed in the 200 — her signature event — and broke an Armory collegiate record. Stevens clipped off a time of 22.65, which topped her previous indoor PR of 22.98. Washington also ran an indoor PR — this one at 60 meters — but finished 3rd behind two teammates: Stevens (2nd) and Cunliffe, the meet champion. Cunliffe crossed the finish line in 7.13 and currently holds the collegiate lead by five hundredths of a second. Wallace saw her competition in the short hurdles reel off some quick times earlier this season, then one-upped them. She took over the national lead with a time of 7.96 in the 60 hurdles two weeks ago, then lowered that to 7.91 at the East-West Challenge. Wallace wrote her name in the collegiate record books as the 8th best indoor performer in that event. The other new addition to the Watch List is Oklahoma State’s Kaela Edwards. The 2016 NCAA indoor mile champ broke the 1000-meter collegiate record with her effort of 2:40.79 at the Holiday Inn Invitational. Other members of the February Watch List include the Georgia duo of Keturah Orji and Kendell Williams, Ole Miss star Raven Saunders and Alabama’s Quanesha Burks. Orji and Williams have been their normal consistent selves. The former has only competed in the triple jump once this season and established a new PR in the indoor long jump (6.63m/21-9). The latter recently debuted in the pentathlon and cruised to a victory at the Razorback Invitational with a score of 4476. Saunders has thrown every weekend since her debut in January and eclipsed the 19-meter barrier once again. She accomplished that feat at the Commodore Invitational with a heave of 19.10m (62-8). Saunders is one of three women in NCAA history to throw 19 meters or farther on multiple occasions under a roof (Tia Brooks and Linda Gerraughty are the others). Burks is the only athlete on The Bowerman Award Watch List that has yet to debut. 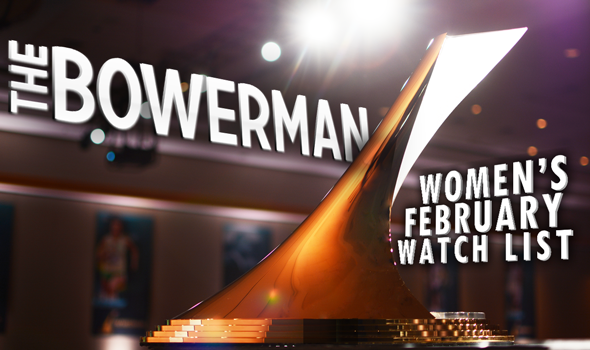 Five athletes were considered by The Bowerman Award Watch List Committee but didn’t receive enough votes to land on the Watch List: Southern California’s Deanna Hill, Kentucky’s Sha’Keela Saunders, Missouri’s Karissa Schweizer and the Arkansas sister duo of Lexi Weeks and Tori Weeks.